For centuries, a rite of passage for French gourmets has been the eating of the ortolan. These tiny birds -- captured alive, force-fed, then drowned in Armagnac -- were roasted whole and eaten that way, bones and all, while the diner draped his head with a linen napkin to preserve the precious aromas and, some believe, to hide from God. There's a famous story about Francois Mitterrand having ortolan for his last meal. Not sure if its apocryphal, but apparently he was dying of some terminal disease, and decided t was time to die. He ate the bird then laid in bed for several days until he died. What brought me to France in the first place was a story I'd heard about François Mitterrand, the former French president, who two years ago had gorged himself on one last orgiastic feast before he'd died. For his last meal, he'd eaten oysters and foie gras and capon—all in copious quantities—the succulent, tender, sweet tastes flooding his parched mouth. And then there was the meal's ultimate course: a small, yellow-throated songbird that was illegal to eat. 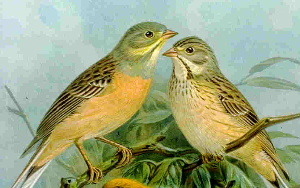 Rare and seductive, the bird—ortolan—supposedly represented the French soul. And this old man, this ravenous president, had taken it whole—wings, feet, liver, heart. Swallowed it, bones and all. Consumed it beneath a white cloth so that God Himself couldn't witness the barbaric act. I wondered then what a soul might taste like.